What came as no surprise to anyone keeping tabs on videogame news over the past few months, the “secret” collaboration between Nintendo and Ubisoft was finally revealed during Ubisoft’s press conference at E3. But unlike what most were expecting, it was anything but a trainwreck. 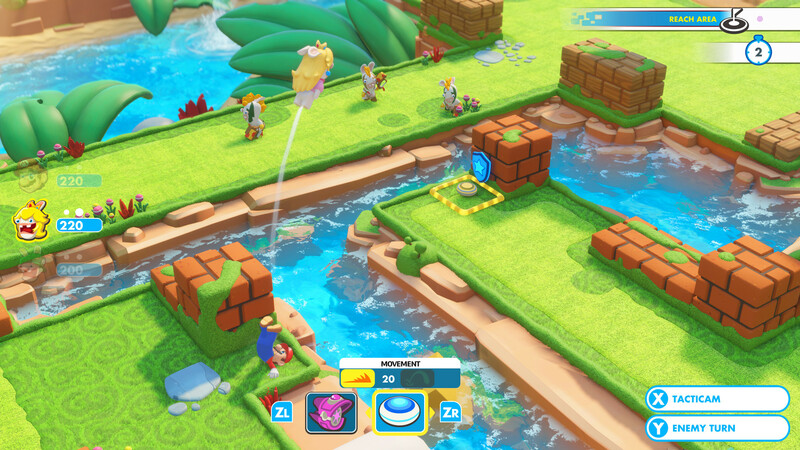 In fact, Mario + Rabbids Kingdom Battle is one of the best looking upcoming third-party Nintendo Switch games. I had a chance to try the game out during our appointment with Nintendo at the show floor, and without a doubt, I really want to play this now. I was withholding my opinion of the concept of a new Rabbids title that would include Mario elements in it until it was actually revealed in an official manner, so when I found out (along with the entire world outside of Ubisoft’s offices) that it’s basically going to be a cartoony XCOM: Enemy Unkown-like game, I was intrigued, being a gigantic fan of that franchise and the genre as a whole. 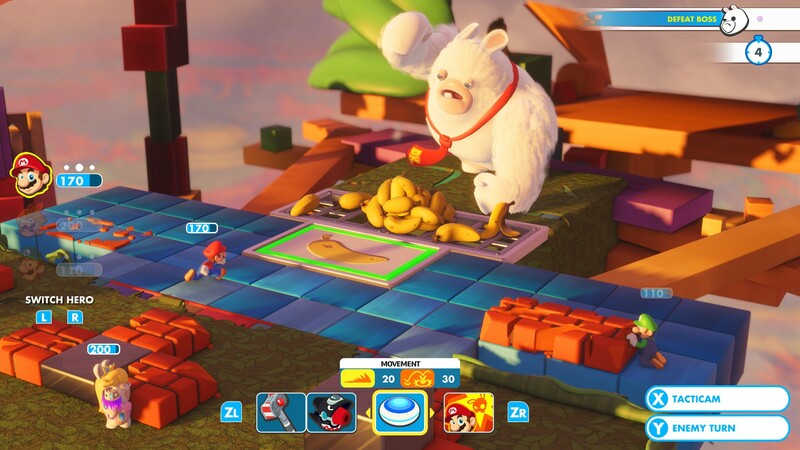 The demo itself picks up as soon as the opening movie is done, with Mario and a few rabbids tagging along in single file, running their way across an incredibly colorful but albeit linear world. The rabbids, at first glance anyway, aren’t nearly as annoying as they usually are in solo games. One’s dressed like Princess Peach and loves to take selfies, while the other’s Luigi – and surprisingly enough, did not overstay their welcome. For the battle itself, it really felt like a competent turn-based tactics game, complete with cover mechanics that actually mattered and came into play. Walls can be shot off with blasters, reducing cover to 0, and even while in cover, none of the characters on my team were safe. All the right boxes were apparently checked. I was playing a legitimate strategy and tactics game that just happened to be happy-go-lucky, a very welcome variation to the usual doom and gloom of XCOM and its brethren. And I’ll just toss this out there: it’s been confirmed that Mario + Rabbids does not include permadeath. The core abilities are also pretty fun and extremely useful. Bouncing off of teammates quickly proved to be important when closing the gap on enemies that happened to be farther away than my attacks could reach or behind cover. I was able to pretty much flank them at any point, as well as get an extra attack in. On the other hand, the same could happen to my team, according to the Nintendo rep helping me test the game. It didn’t happen during my time there, but it’s an exciting prospect to look forward to in the final release, what sounds like a real bout of tag between both teams, who can take out the other faster and more efficiently. It was also cool to get to mess around a bit with the options, like switching out guns and even team members — speaking of those, your team can only have up to three of them active at the same time, so balancing composition should prove imperative throughout the game if such limitation is in place. In regards to the setting, the only clue given was that it all takes place somewhere in the Mushroom Kingdom, but since the rabbids have invaded, you can expect to run into some of them taking the place of some fan favorites. The entrance to the Los Angeles Convention Center’s south hall was graced by a giant statue of one of the bosses in the game, a strikingly familiar looking but slightly off Donkey Kong rabbid, who just happens to be one of the bosses in the game. Whether or not other characters from the Mario universe will receive the same treatment instead of being their actual selves in Mario + Rabbids remains to be seen. It really seemed like Kingdom Battle had everything going against it before it was even officially announced, considering how badly some of Mario’s foray outside of first-party releases usually turn out, but astonishingly enough, this one is looking mighty fine. It plays extremely well on the Switch, and aside from a few technical hiccups mostly tied to performance (an aspect that is easily overlooked when checking out an early build of a game), it has the potential to be a breakout hit. Mario + Rabbids Kingdom Battle is coming out exclusively on the Nintendo Switch on August 29th, 2017.